I discovered something this weekend, something I probably should have known. It turns out I can no longer stay out till 4 AM without suffering any consequences. I was out for my friend Steph’s bachelorette party. I had a great time, and I hope she enjoyed her “last night of freedom”. Unfortunately, even though I didn’t have much to drink, I was completely exhausted the next day. I had a busy day planned to so forced myself to get up early. The people at Eat In Eat Out Magazine have been kind enough to include I’ll Have What She’s Having in their Holiday edition. I need to submit two holiday recipes to them, so I planned to make at least one dish last weekend. But I was tired and cranky and really not in the mood for a holiday style dish. I wanted something easy and comforting. I wanted a cookie. And a glass of milk. So that’s what I made. A simple oatmeal cookie, the kind of cookie that brings back memories of childhood and makes everything better. These cookies are crispy on the outside with a chewy center. The sour cherries are a great contrast to the sweet cookie, and the cardamom adds a touch of warmth. I had them with a glass of milk, and then I took a nice long nap. In a medium bowl, stir the oats, flour, cherries, baking soda, salt and cardamom together. In a separate bowl, beat the butter and sugars together with an electric mixer until light and fluffy. Beat in the egg, followed by the vanilla. With a wooden spoon, stir in the flour mixture until well combined. Line 2 baking sheets with parchment paper. Using about a tablespoon of dough per cookie, and drop them two inches apart on the baking sheets. Bake for 12 to 16 minutes. Let cool on the baking sheets for 5 minutes then transfer to a wire rack to cool completely. Glad you had a good time. Cookies look great. Just found your blog and I have to say I love the name of it! 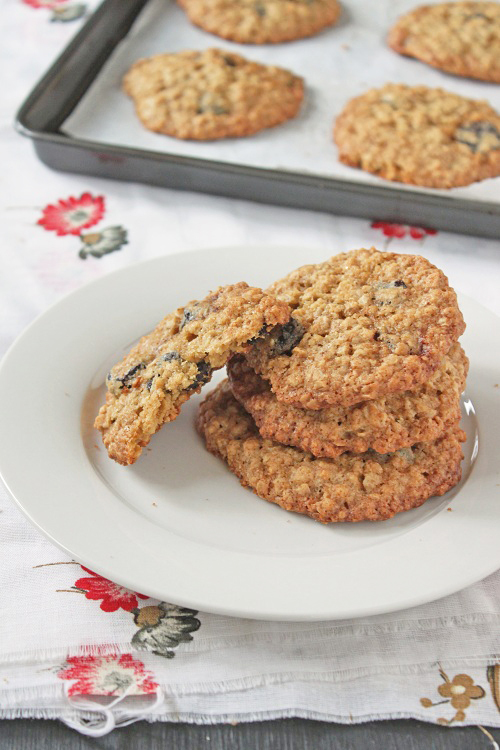 These cookies look delicious, I can never have too many oatmeal cookie recipes. These cookies look delicious and comforting – I often use cardamom and I love the use of dried sour cherries – yum! Lovely blog too! I can barely make it past 10pm these days, let alone well into the early morning! Thankfully, most of my friends are long married and I have none of these sorts of things to attend any more. Boy, that makes me sound old, although I am only 38! These cookies look delicious, love that you used cardamom. Lovely, tasty oatmeal cookies? It doesn’t get any better. Great pics, by the way! 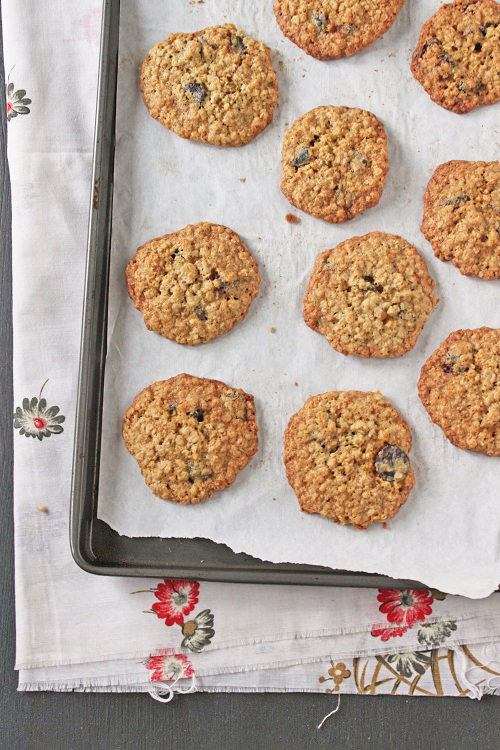 I love any cookie that has oatmeal, but these sound even more amazing with the cherries! I love the combination of oatmeal and cherries. Thanks for the wonderful recipe and delicious looking photos. A nap and a cookie sounds good to me too, guess that mean I’m old! Congrats on the upcoming magazine feature. Hi, sorry for the late comment; I landed here after searching for a cherry-cardamom cookie recipe. I must ask, how tested was this recipe? I found it made a much better granola than cookie. 12 minutes yielded very dry, thin, crispy cookies that did not stay together and were quite oily on the edges. Not enough flour or too much oats. I’ll admit that I had reservations when I realized there was no way that much brown sugar was not going to ever appear light after creaming, and that the cooking time had such a wide range from top to bottom. I’m sorry the recipe didn’t work out for you. At least you found a way to use it! It’s been a while so to be honest I don’t remember how many times I made the recipe. It is possible there’s a mistake in the measurements. I’ll make them again this weekend to test it out.